Electric bikes are all the rage in Europe, and pedal-assist e-bikes have just been cleared for New York City streets. Biking in New York City is, to put it mildly, daunting. There are the distracted drivers on their phones, pedestrians who don’t respect bike lanes, the noise and rush of traffic right next to you. For the people who commute by bike, though, it’s all worth it. But what if you don’t work out regularly and ridden a bike only sporadically since getting your training wheels off? If you’ve ever thought, “I’m not a cyclist, but I want to be,” you’re exactly the demographic who’d be best served by an electric bike. I am that biking novice, and a recent test ride on one of these relatively new hybrid machines on the streets of Williamsburg made a strong case for getting into the saddle. “We’re providing alternative forms of transportation for people who traditionally haven’t had cycling as an accessible path for them,” says Anna Marie Wolf, co-owner of Sun & Air Bike Shop located just 50 feet from the bike entrance to the Williamsburg Bridge, one of the most heavily trafficked bridges by bikers in the country — and it’s only going to get busier. When the L train shuts down in April 2019 for 15 months to fix damage caused by flooding during Hurricane Sandy, it’s expected to send about 10,000 more daily bike commuters into its lanes (not to mention adding to the misery of an already overburdened subway system). I have never before commuted by bike. We recently got an electric assist bike for the family and while my car was being serviced today I used it to go to gym and back. Mind blown. So much fun and nicer than driving. There are two kinds of electric bike, which has created some confusion. The ones favored by delivery drivers tend to be throttle-driven bikes, which work like motorcycles and do not require any pedaling. They exist in a legal limbo because New York State classifies them as motor vehicles but they can’t be registered, which has led to $500 fines and confiscations by the NYPD that has sparked outrage over hurting the livelihoods of an already poor and largely minority population. The kind I tried is a pedal-assist bike. They look just like a regular bike with a battery mounted on the frame. As the name implies, the electric motor gives only as much or as little power as you’re putting into the pedals. Mayor Bill de Blasio’s office clarified its stance on e-bikes back in April, declaring pedal-assist bikes street legal. Trek makes several e-bikes in a range of prices starting at $2,299 up to $5,199, which is the Super Commuter+ 8S that I rode at Sun & Air. For that price bump, you get more speed (up to 28mph), longer battery life and larger tires better suited for the rigors of city riding. You feel the motor kick in as soon as you touch the pedals, but it’s not a jerk — more like getting a gentle push, like catching a wave while surfing. Depending on the weight of the rider and which of the four modes you choose (from 25% up to 200% assistance), it can go between 30 and 80 miles on a charge, after which it turns into a regular bike. The battery can be removed with a key and plugged into a wall, fully charged again in three hours. My main concerns were going too fast and being unable to stop. But it never felt like the bike was in control — if I didn’t pedal, the motor wasn’t pushing out power, and the hydraulic brakes made stopping smooth and easy. In fact, everything about the experience was smooth and easy. What I wouldn’t have given for this bike while huffing and puffing through the hills of Tuscany! While all the usual hazards of biking were present — pedestrians stepping off the curb without looking, cars inching into bike lanes, bumps and small potholes — the stability from the bike’s wider tires and being able to accelerate more quickly kept me out of trouble. And as promised, I didn't break a sweat, which the person who had to stand under my armpit on the crammed J train (at 9:30 a.m.!) on the way to my office was certainly grateful for. Biking is not totally safe no matter how close attention you’re paying. I spoke to three bike commuters for this story, and all of them have gotten in serious accidents and suffered injuries: getting “doored,” being sideswiped by a truck and hitting a large bump on a poorly paved street. Yet they continue to get back in the saddle. Bikes in general are also tempting targets for theft. 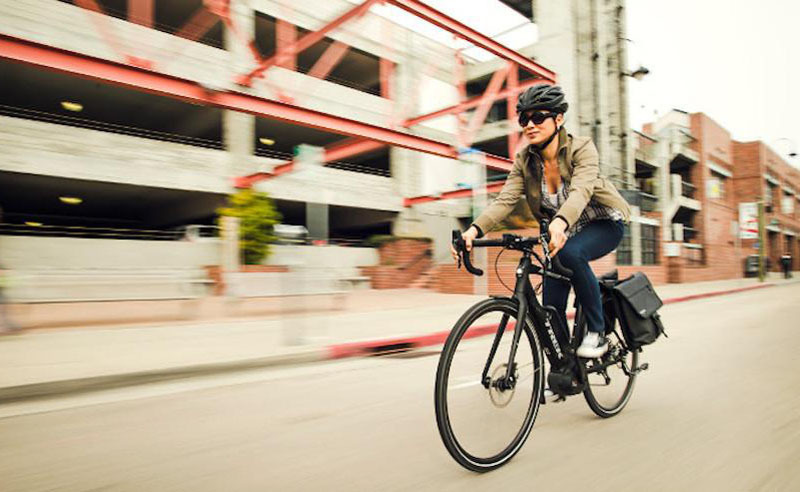 Removing the battery doesn’t stop e-bikes from working as a regular bike, and most workplaces don’t have bike storage ­— let alone bars and restaurants if you want to hit up happy hour. And while they’ve gotten cheaper as more people buy them — over half of Trek’s sales in the Netherlands are e-bikes — they’re still pricey. Shutting down the L train is expected to double the number of bikers in Manhattan, which has led the MTA to propose creating the borough’s first two-way protected bike lane on 13th Street. But ideas for easing the lives of the 400,000 people who rely on the L have been slow in coming and range from fantasy (a gondola like the Roosevelt Island Tram) to more realistic like closing 14th Street to car traffic, though that idea is struggling to gain traction. The city’s bike infrastructure is already inadequate, says Wolf — while Rose compares some Brooklyn streets to a “post-Soviet war zone” — but there may be some light at the end of the tunnel.